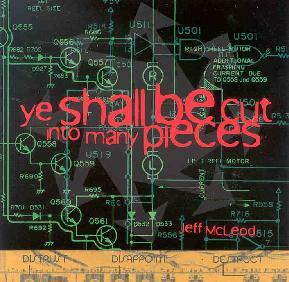 Jeff McLeod - "Ye Shall Be Cut Into Many Pieces"
ye shall be cut into many pieces unfortunately presents itself as a jumbled collage of noise, literally noise. Jeff McLeod states in the liner notes of his release that he spent over a month "piecing things together to create a natural flow." The sounds recorded by McLeod appear to be treated with a combination of un-ambitious tape and digital manipulation. This album comes off as a string of random audio for the sake of itself. This work doesn't seem to capture the well-constructed focus that artists like Negativ Land and Severed Heads seemed to achieve on such works like Escape From Noise and City Slab Horror; in these pieces there appears to be a theme within each where as ye shall be cut into many pieces brands itself as snippets of essentially anything and everything without a vision for what is to come of it. The field recordings McLeod collected over the year while in various places are affected with guitar and processed drums and drum machine affects. These treatments by McLeod and his choice of editing produce mainly a 19-track album of irritably unintelligible collage work. Out of 19 tracks of sound there aren't any apparent stand out tracks on this release. More theme, focus and thoughtfully used manipulations could possibly remedy many of the problems found on this album. For more information you can visit Jeff McLeod's web site at: http://www.soundandchaos.com. Hear sound samples at: http://www.mp3.com/mcleod. Contact via snail mail c/o Jeff McLeod; 1629 Chateau Circle; Montgomery, AL 36106.